Easter eggs, a smiling sun and “He is Risen” printed on a cloud, are the setting for a ‘meaning of colors’ poem. I haven’t been able to find the name of the author of this poem to give credit. There are no rules to this project other than making sure to use at least one egg of each color mentioned in the poem. The directions for, “He is Risen,” can be found in the 1st Grade Projects Gallery in the sidebar. 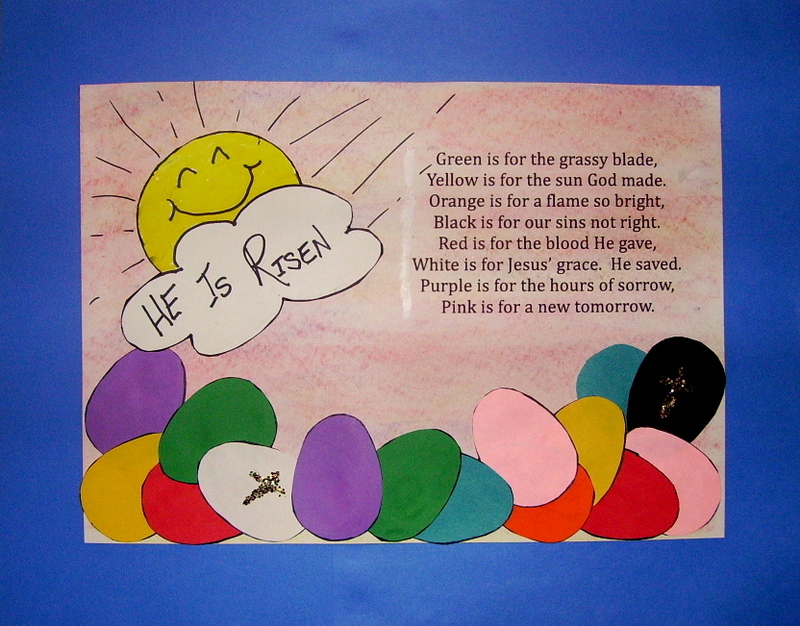 This entry was posted in 1st Grade, Easter and tagged 1st grade, easter art project, easter art projects for kids, easter christ is risen art, easter craft project, easter craft project for kids, easter poem craft, he is risen. Bookmark the permalink.